A story about the versatility of the rice cooker. NASA’s Phoenix spacecraft has discovered evidence of past water at its Martian landing site and spotted falling snow for the first time, scientists reported Monday. The snow was detected by a laser instrument 4km of the ground. Unfortunately, the snow is vaporizing before it gets near the ground, so you won’t be seeing any snowstorms on Mars any time soon. Still, it’s interesting. Tina Fey back as Sarah Palin on SNL! At least she’s witchcraft free! Yes, I think this is weird, but a lot of other things in organized religions seem odd to me. What makes one kooky ritual different from another? But, can you imagine what kind of firestorm this would be if this were Barack Obama in the video instead of Sarah Palin? 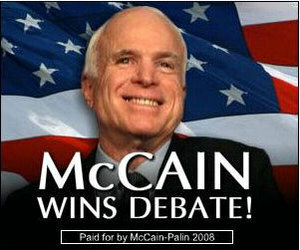 McCain declares debate victory- before the debate! Although the fate of tonight’s presidential debate in Mississippi remains very much up in the air, John McCain has apparently already won it — if you believe an Internet ad an astute reader spotted next to this piece in the online edition of the Wall Street Journal this morning. Here’s the ad from the screenshot in the article. From USNews.com: Sarah Palin: Out of Control Talking Point Machine or Political Magnetic Poetry? Palin: That’s why I say I, like every American I’m speaking with, we’re ill about this position that we have been put in where it is the taxpayers looking to bail out. But ultimately what the bailout does is help those who are concerned about the healthcare reform that is needed to help shore up our economy. Helping the–it’s got to be all about job creation too, shoring up our economy and putting it back on the right track. So health care reform and reducing taxes and reining in spending has got to accompany tax reductions and tax relief for Americans and trade–we’ve got to see trade as opportunity, not as competitive, scary thing, but one in five jobs being created in the trade sector today–we’ve got to look at that as more opportunity. 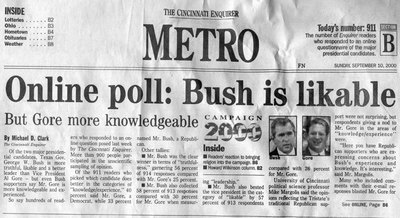 It’s like a talking points machine gone out of control. Or magnetic poetry that you have on your fridge–in fact, you can try it at home. String together key words and phrases like “shore up the economy,” “reduce tax rates,” “healthcare reform,” and “trade” and see what kind of Palinisms you can create. 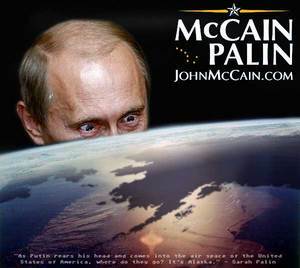 I think Palin needs something even simpler. 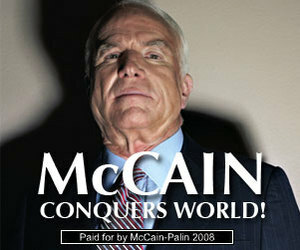 Maybe the McCain campaign can give her a custom Magic 8-ball that she can shake and read during her interviews. In the Roosevelt Room after the session, the Treasury secretary, Henry M. Paulson Jr. literally bent down on one knee as he pleaded with Nancy Pelosi, the House Speaker, not to “blow it up” by withdrawing her party’s support for the package over what Ms. Pelosi derided as a Republican betrayal. It’s sad how the Republicans are playing politics with this whole situation. There were possibly other options besides a bailout, but those things would have to have been done months ago. Now, we’re left with pretty few options, none of them pleasant. If the Republicans hadn’t been claiming all the time that the “fundamentals of the economy were strong”, we might have developed a plan to help prevent foreclosures and the subsequent collapse of the real estate market. We’re going to see some form of bailout whether we like it or not. It’s either going to be a comprehensive plan or the government is going to end up propping up banks as the fail, one by one, like Washington Mutual yesterday.